This interesting name is of Anglo-Saxon origin, and is locational from any one of a number of minor habitation sites situated mainly in the North of England. The surname derives from the two Olde English pre 7th Century words "hol" meaning a hollow, plus "rod", a clearing; hence, "a clearing in a hollow". Locational surnames, such as this, were usually acquired by a local landowner, or by the lord of the manor, and especially by those former inhabitants of a place who moved to another area, usually in search of work, and were thereafter best identified by the name of their birthplace. The surname had already clearly emerged by the latter part of the 13th Century (see below), and one early occurrence is to be found in the Subsidy Rolls of Suffolk (1327), where Gilbert de Holrode was recorded. A George Holroyd is mentioned in the Register of the Freemen of the City of York in 1709. 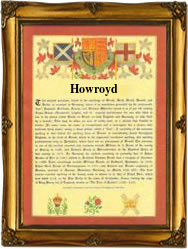 As the surname developed it was to be known under variant spellings, such as Holroyde, Holdroyd and Howroyd. Mary, daughter of William Holroyd, was christened on December 31st 1615, at Rochdale. A famous namebearer, recorded in the "Dictionary of National Biography", was John Baker Holroyd (1735 - 1821), first Earl of Sheffield, a statesman and a friend of Gibbon the historian. The first recorded spelling of the family name is shown to be that of Thomas Holerode, which was dated 1296, in the "Subsidy Rolls of Sussex", during the reign of King Edward 1, known as "The Hammer of the Scots", 1272 - 1307. Surnames became necessary when governments introduced personal taxation. In England this was known as Poll Tax. Throughout the centuries, surnames in every country have continued to "develop" often leading to astonishing variants of the original spelling.